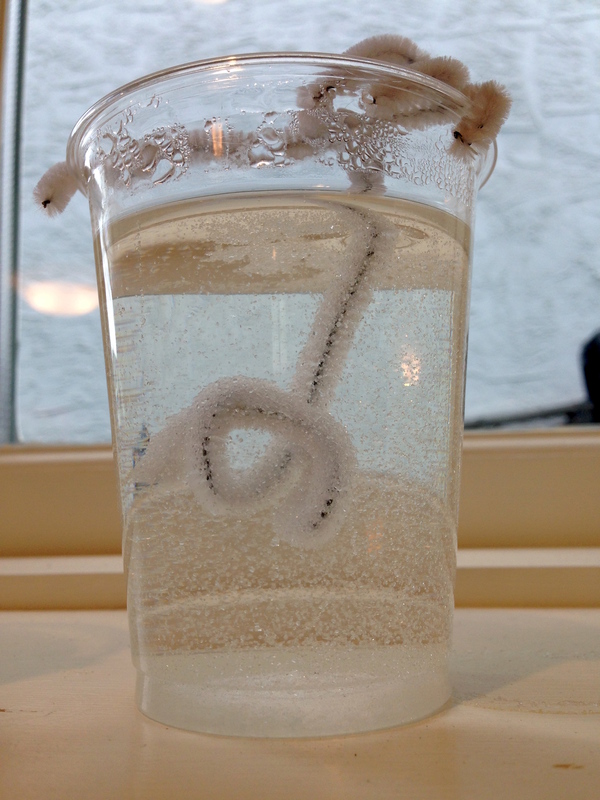 Students make pipe cleaner shapes, then grow borax crystals on them over two days. Some crystals get so large that you can see the flat faces on them. They make a great ornament to hang near christmas lights. NOTE: borax is toxic in high amounts. Do not eat this ornament! For each student, put 3 tablespoons of borax powder in a plastic cup or glass jar. Fill the cup with boiling water, and stir to dissolve the powder. Alternatively, make one large batch of borax solution, and divide among cups. Each student should make a shape out of the long pipecleaner, small enough to fit in the cup without touching the bottom. Lay the half pipe cleaner across the top of the cup, and hang the pipecleaner shape on it, so that the pipecleaner shape dips into the borax/water. You might need to make a little hook with another piece of pipecleaner. (Students can check that their shape fits into an empty cup before hanging it in the borax solution). Put the cup on a shelf where it will not be disturbed. 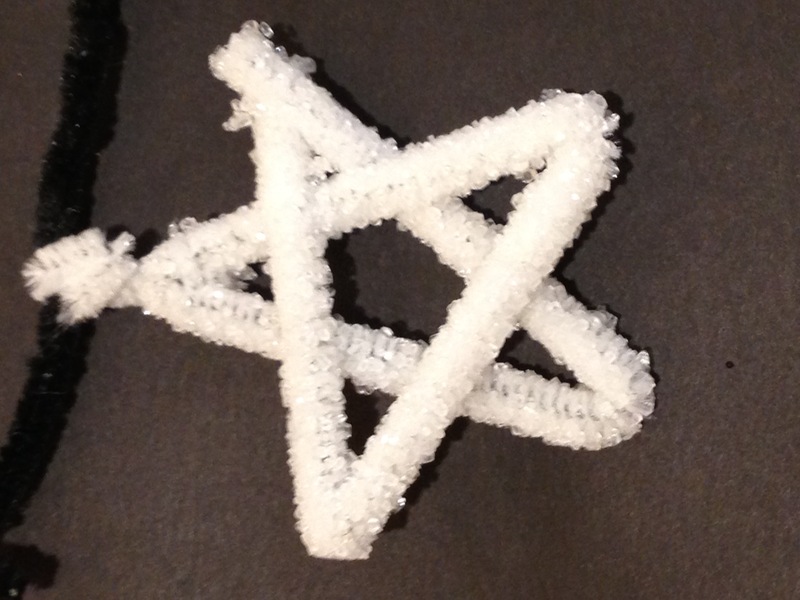 As the borax/water cools, box-shaped crystals of borax form on the pipecleaner. This usually only takes an hour or so. Wash out the cup, and hang the pipecleaner shape in the empty cup again, so that the borax crystals can dry. 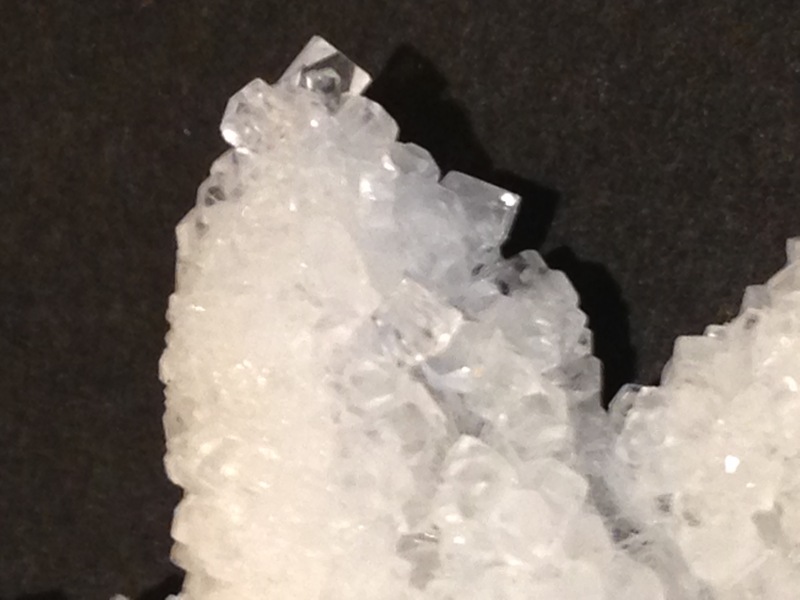 The borax crystals sparkle in a bright light e.g. on a christmas tree (hung high away from little hands). Sometimes you can even see the flat faces on the bigger crystals of borax. It still worked with old borax that left a white suspension when dissolved in the water.